Tommy Kovac is one of the most interesting, talented people I know. Before sharing a really cool childhood story about Tommy, let’s look at some of his first publications. 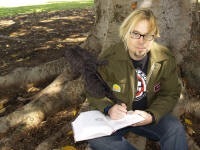 He’s been writing and illustrating these comics since 1999. Links to his website are below. 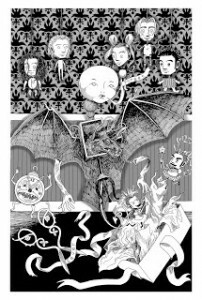 SLG Publishing, illustrated by Andy Hirsch. Both graphic novels are for all ages. I met Tommy at Books Born Here, our writers’ group that meets in Riverside, California. One time he shared a memory about his childhood. I asked him to retell it so I could post it on my blog because it says a lot about who he is and why he was the perfect one to write Wonderland, even though his publisher didn’t know it at the time he asked him to work on it! “I was little, maybe around 5 or 6, and I loved Alice In Wonderland. We always had lots of books around the house, and it was one of the first books I learned to read all by myself. I used to read it out loud to my parents. I was also pretty obsessed with the ride at Disneyland. I got my dad to dig me a big, deep ‘rabbit hole’ in our back yard so I could pretend to be Alice crawling in and floating down to Wonderland. I spent hours in that hole, imagining. “When my publisher at SLG first asked me to write ‘Wonderland‘ for the Disney project, I excitedly told him how much I love the original story and even blurted out the thing about my dad digging me a rabbit hole in our back yard. “I was an only child, and my parents were totally awesome. Still are. Can you imagine a dad going along so easily with his son pretending to be ALICE IN WONDERLAND?! And my dad was a total football jock in high school. “I remember him trying to throw the football around with me in our back yard. I think he only tried ONCE, and quickly realized I was better suited to drawing and other ‘artistic’ pursuits. Interestingly enough, my dad is a well-rounded guy and also used to draw and sketch a lot. I remember watching him and being fascinated by the special pencils and the crumbly eraser. “Both of my parents are very artistic, but in different ways. My mom has a total Martha Stewart streak. Not the insider trading kind, or the scary ice queen kind, though! What I mean is that my mom has a real knack for design and color, and a great eye for visual balance. Her house is always beautiful, and she can make really cool handmade things. She has superb taste, which is a quality I’m not sure can be taught. What I’m trying to say is that I totally get whatever creative talent I have from both parents. “My mom gave me my first typewriter when I was about 9, an old manual kind that clacked when you hit the keys and chinged when you hit the carriage return. She taught me which fingers are supposed to go with which keys, and I immediately started typing my own little stories. It would be hard for me to talk about my creative pursuits without also talking about my parents, because they’ve been so encouraging and supportive all the way through. “You know, I work with teenagers in the school library, and there are plenty of kids whose parents tell them exactly what they should be and what they should do with their lives. It’s sad. You see these poor kids who have been convinced to go to law school, or to become doctors, when they really want to dance, or sing, or paint. They’ve been taught to equate success with money, which I think is wrong. Thanks for sharing your memories and insight with us, Tommy. To read an interview of Tommy Kovac by Stephanie Jefferson, go here. Some of his artwork is for sale on his website. A question for my readers: What do you think about graphic novels? Do you have a favorite comic book series? Or did you as a kid? Tommy – Thank YOU for sharing your wonderful childhood memories with us and letting me showcase some of your work. I hope everyone goes to Stephanie's blog to read her interview of you. Yep, I'll see you at critique! Oh, by the way, I checked my stats and have had a LOT of hits for this post, so you're quite a popular dude! Munir – Archie, Veronica, and Betty were my favorite comic books, too! I loved them. That Jughead was such a character! How cool that you saved your kids' comics. I wish I had saved mine!Maria – I think any interview of Tommy would be awesome. He has so many interesting things to tell us. And I agree that it's so neat that his folks let him have the giant hole in the backyard to play in and let his imagination soar. Thanks for the great comments. Oh what cool drawings!I haven't read a graphic novel yet (hangs head in shame). Your guest and I have Alice in Wonderland in common as a book that made a BIG impression. His work is fabulous, and I love graphic novels. I love graphic novels. When I was a kid they were call Classic Illustrated. Those comics introduced me to many of the world's best literature which I later went on to read in their full form when I got older. Sharon – I didn't even know what a graphic novel was until a couple years ago! They're just now becoming quite popular, so no reason to hang yer head in shame!Lee- That's really neat that Alice in Wonderland had such an impact on your life, too. I've never read the book, but I love the movies and saw plays when I was a kid. (My turn to hang my head in shame! )Bish – That's so interesting that graphic novels were called Classic Illustrated when you were a kid. I wonder if they had them here in the states because I don't remember ever hearing about them, but I think that's such a wonderful way to introduce kids to the Classics! Thanks for your input. Wow. What a great interview! I really enjoyed all the samples that you used to illustrate the piece, Lynn. Tommy – you are like, the supreme being of talent! Like, if there was a Greek god of Graphic Art – that'd be you. I need to take a pill now. 🙂 Super job, Lynn! Tommy sounds like an awesome guy!! And a superb artist! Thanks for sharing, Lynn. I can't wait to get a chance to look at some of his work in depth! Annie – Thanks so much! I love the "Greek god of graphic arts!" Haha, that's great! Heather – Thanks! You'll love Tommy's work. He's so darn humble, too.Nutschell – It's so good to have you visit again. I value your opinion, so thank you! Yes, you'd love Tommy's work.Ellie – I can see you riding one of those cool uni-zebra-horses, for sure! I'll ask Tommy where he got it and hook you up! Thanks!